a work entitled "At the Beach." NEW ORLEANS NATIVE Chris Campbell had planned on becoming a doctor. She completed a fellowship in nuclear medicine at Harvard University, but her true passion kept nagging at her. 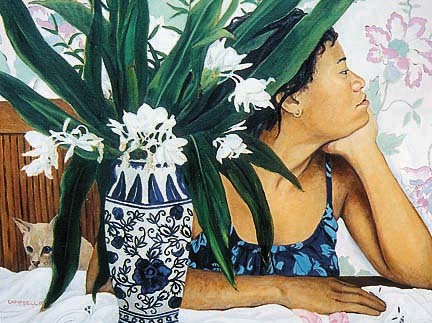 She decided to give up medicine and took up painting full time, first studying at the Students Art League in New York City. 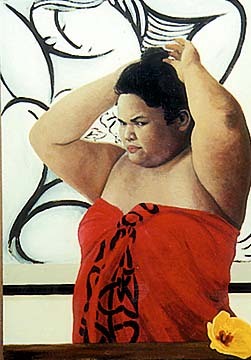 Since moving to Hawaii, Campbell became fascinated by Polynesian women, whom she finds stately and beautiful. 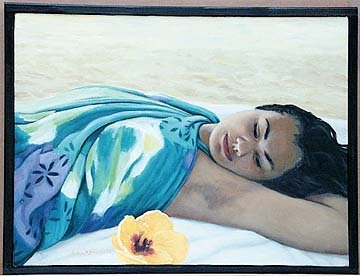 Her realistic paintings, many using her cleaning women as models, have won awards locally and found a steady audience. 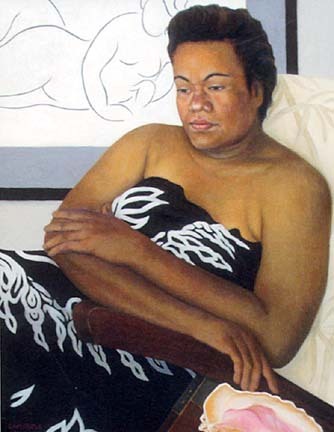 She is represented by Cedar Street Gallery, which is showing her work in conjunction with Madge Tennent, another painter who favored stately Hawaiian women as models. See previous page for hours.